Following on from the post; The Truth about Low-Fat Salad Dressings, here is a tasty, quick and nutritious salad recipe, bursting with flavour that offers a good source of protein and those all-important, skin loving essential fats omega 3, 6 & 9. This recipe is great eaten at lunch or as light dinner. Slice the chicken into strips. Place in a bowl. Crush the garlic and add to chicken along with the lemon juice and parsley. Cover with cling fi lm and place in the fridge for at least 1 hour. Using a griddle pan cook the chicken strips. Slice the carrot into baton strips and place into a salad bowl. Add the mixed lettuce leaves, cherry tomatoes and sliced onion. To make the dressing: In an empty jam jar mix the Dijon Mustard, Ultimate Oil Blend and white wine vinegar. Place the lid back on and store in the fridge. 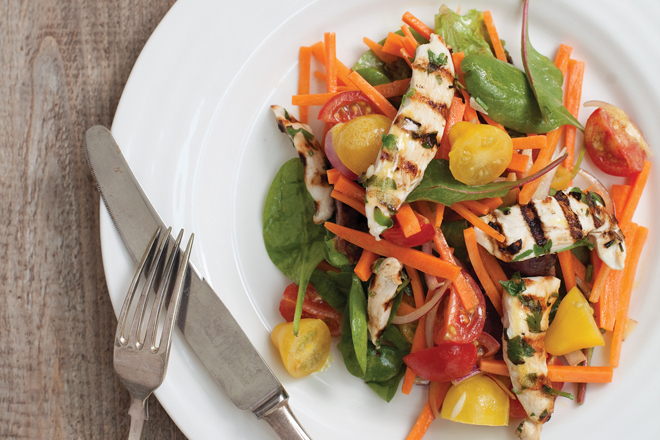 To serve: Add the chicken strips to the salad, add the vinaigrette and toss. If this is used as part of a healthy eating plan the weight will fall off.